PHOTQ A: Edge-glue panels for the sides and Hie bottom. As you tighten the clamps, the glue will cause the Joints to slide out of alignment, so adjust them as well as you can to keep them lined up. Be sure to use damping pads to protect the wood. PHOTO B: Drill small locator holes through the side template, at the centerpolnts shown for each dowel location. Use scrap plywood underneath to prevent drill bit tear-out. 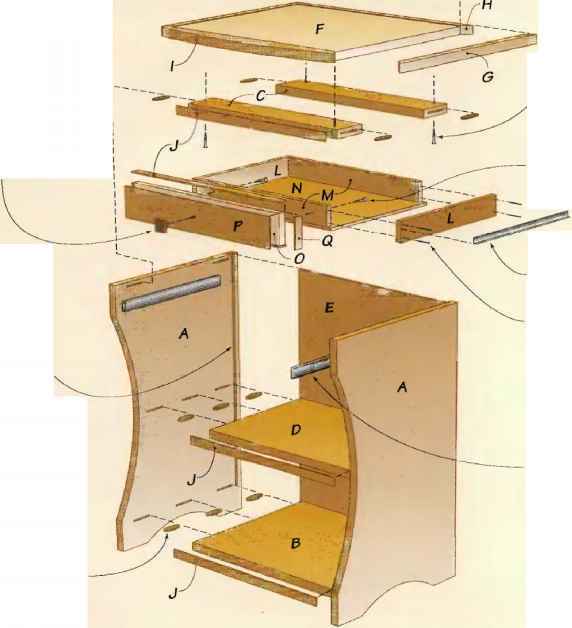 The parts for this magazine rack can all be cut from two o-nL-Iong cherry boards. We edge-glued three strips of %-in. (after planing) cherry to make the side panels. The K'-iri.-thick bottom panel is also made from edge-glued cherry. O Plane an 8-ft.-long, % cherry board that's at least 414 in. wide to % in. thick. Joint one edge of the board, then rip-cut it to 4 Mi in. wide (4Vie in. is okay). Crosscut six 15-in.-long sections, and edge-gl ue them into two panels that are roughly 12 x 15 in. (See Photo A). For a good glue joint, joint both edges of the middle board in each glue-up. 0 Plane a x 4 in. x 8 ft. board down to Yi in, thick. Rip-cut a 3-ft.-long section from one end of the board, joint one edge, then r ip-cut to 3W in. wide. Cut the board into three l2-in.-long sections. Arrange the boards into a panel roughly 9x12 in. 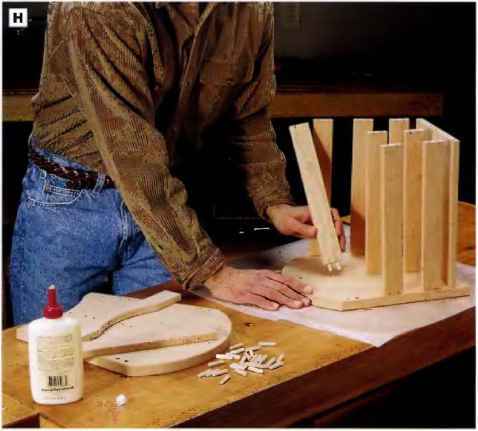 (joint both edges of the middle board) and glue up the panel to make the bottom of the magazine rack. © On the remaining 5-ft. section of Yz-in. stock, joint one edge, then rip-cut the jointed side to lYi in. wide. Rip-cut the waste strip to 1 in. wide as well, making sure to run the freshly cut edge against your table saw fence. Install a l A-in.-radius roundover bit in your router and ease all the edges of both strips. Reserve the strips to cut the: rails and the handle. ©Enlarge the Grid Drawing on page 149 to full size In photocopying nr by drawing a grid to scale and plottmg out the pattern using tin; drawing as a reference. Secure the full-size drawing to a piece of Vi-in.-thick hardboard or plywood (we used spray adhesive). 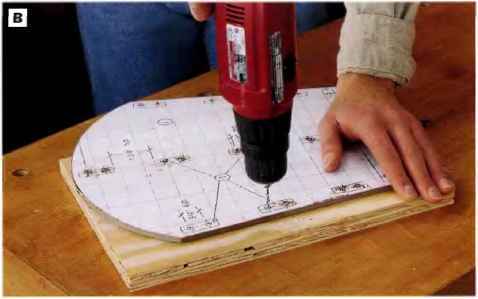 Cut out the shape along the lines with a band saw, scroll saw or jig saw to create a template. Smooth the sawn edges. PHOTO D: Cut out the end shapes. We used a jig saw, but you could use a band saw or scroll saw Instead. Cut along the waste sides of the cutting lines, then smooth the cuts with a file or by sanding with medium-grit sandpaper. PHOTO C; Center ttie template on each side panel and outline the shape. Poke an awl or centerpunch through the template holes to mark centerpoints for the dowel holes. 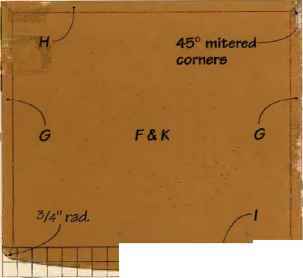 small holes (about the diameter of your awl or centerpunch) through the template at the dowei hole centerpoints shown on the Grid Drawing (See Photo B). © Cross-cut one end of each glued-up panel for the sides so the end is straight and square to the sides of the panel. Lay the template on each glued-up panel with its bottom edge flush with the squared end. Trace around the template to transfer' the cutting shape. 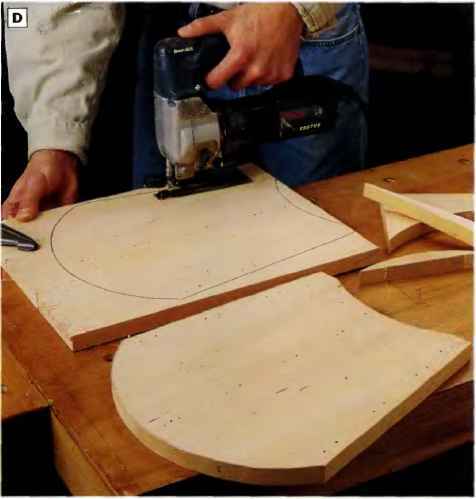 Use an awl or1 center-punch to mark the dowel-hole centers through the locator holes in the template (See Photo C). O Drill W-in.-dia. x in.-deep dowel holes at the dowel-hole centers marked on each side panel. Use a portable drill guide and a bit stop (See Photo E). 0 Cross-cut the strips of V5 x Wi, in. 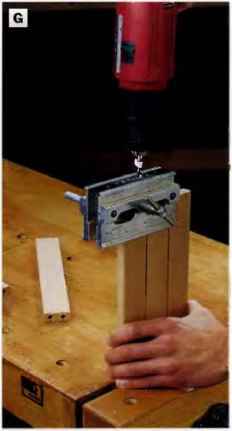 stock into 10, 11-in.-long strips (See Photo F) to make the nine rails and the handle. We used a power miter saw with a stopblock set at 11 in. to speed up the cutting and ensure uniform lengths. 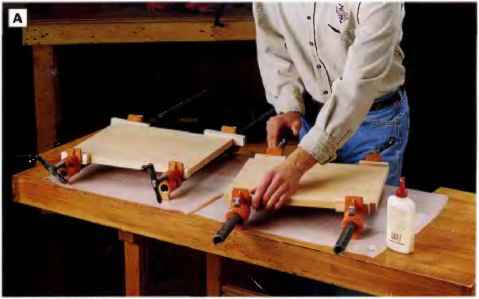 0 Cut out the shapes of the sides using a jig saw, band saw or scroll saw. Cut carefully along the waste sides of the lines (See Photo D). Sand the edges smooth. 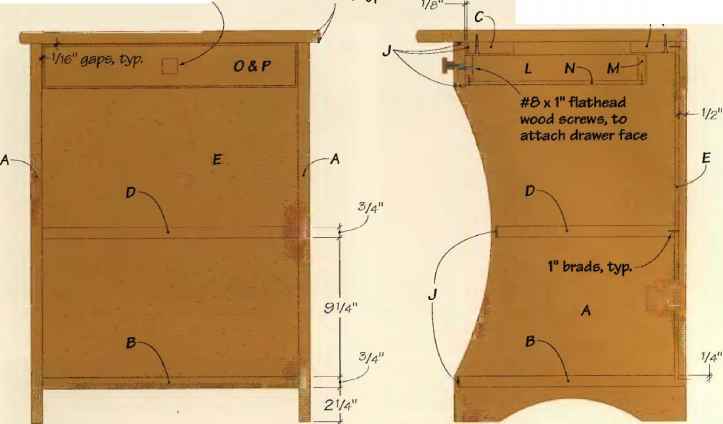 © Choose one piece for the handle and draw a contour line for making the handle cutout. The arched cutout starts 2 Vz in. from each end and is high at the center (See Detail /Jrawing, page 149). 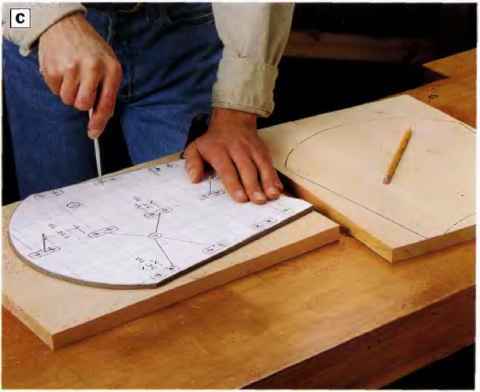 Cut out the arc along the contour line and smooth the cut with a sander or file. PHOTO £ Drill Vis-tn deep dowel holes at the dowel hole centers you marked on each of the two sides with the hard board template. Use a drill guide to ensure straight holes. PHOTO ft Clamp a stopblock to the fence of a power miter saw, 11 In. 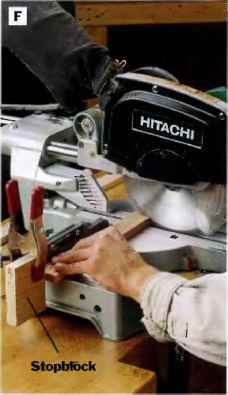 frwn the edge of the Made, to make uniform cross-cuts when cutting the rails and handle pieces to length. Assembling the magazine rack can get. tricky, since it involves 46 dowel pins (and 92 dowel holes). On the plus side, the scale of the project makes it easy to handle, so assembling the rack tefore the glue sets should be no problem. 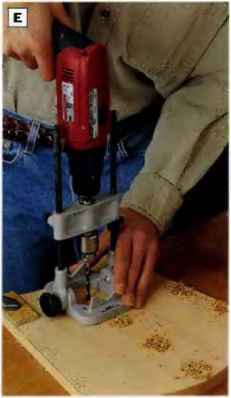 PHOTO 0: Use a doweling jig to drill centered dowel holes in the ends of the rails and handle. Clamp rails together edge-to-edge to provide more surface area for the Jig. PHOTO H: Glue the dowels In the ends of the handle, the slats, and the bottom into the cor responding dowel holes In one side panel.Then Immediately glue dowels into the other end panel and set it onto the upright ends of the parts. Align the dowels into their holes and press the assembly together. corresponding dowel hole in the end of the bottom panel. Use a drill press or a drilling guide to bore the dowel holes. 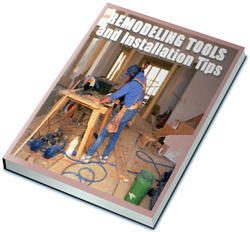 If you use a drilling guide, sandwich each work-piece between scrap boards to provide more support for the guide. © Drill two J4-in.-dia. x 1 tie-in.-deep dowel holes in the end of each slat and in each end of the handle. Use a doweling jig to center the holes. 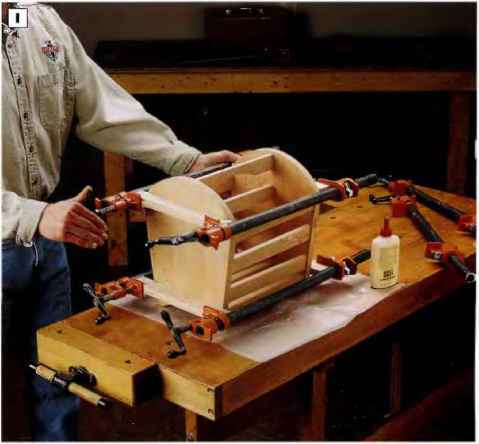 Clamp a few parts at a time into your bench vise, aligning the ends straight across. This provides more bearing surface for the jig (See Photo G). © Sand all the parts to 220-grit. Ease ail sharp edges except for the ends of the raily and handles. ©Apply glue and lightly tap V4 x lli;-in. 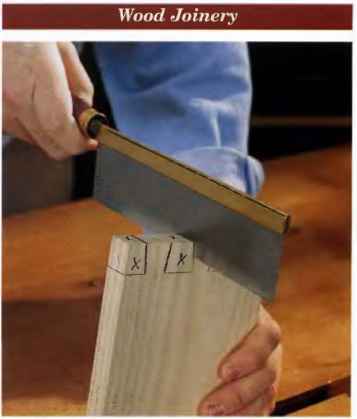 lengths of hardwood doweling into the dowel holes in one end of each cross member (the slats, the bottom and the handle). © Lay one side of the magazine rack on a wdirksurface so the dowel holes are facing up. Glue the joints and insert the cross members (See Photo H). © Immediately glue and tap dowels into the holes in the other side panel. Then lay that panel on top of the exposed ends of the cross members, aligning the dowels with the corresponding dowel holes. 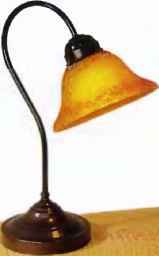 Once the doweis are aligned, seat, them by pressing against the cross members, (lamp the project across its ends, using cauls to spread the clamping pressure (See Photo I). © Touch up any rough surfaces or edges with 220-grit sandpaper. Apply the finish. We brushed on three coats of clear, Danish oil (See Photo J). PHOTO I: Clamp up the rack assembly, using wood cauls to distribute pressure evenly. Use three pairs of bar or pipe clamps. 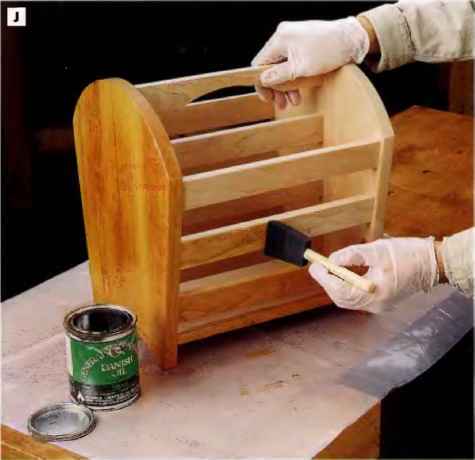 PHOTO J: Because of all the flat, narrow surfaces that are easy to access, a brush-on finish is a good choice for this magazine rack. We used three coats of Danish oil for an even, satiny finish. 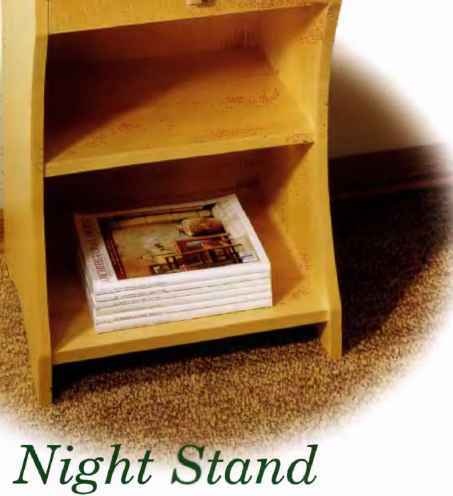 Tuck remote controls and reading materials away neatly in this compact night stand project. Our simple design makes use of a variety of building materials including solid maple, maple and birch plywoods and melamine-covered particleboard. Most noticeable however, is the curly maple veneer that spruces up the tabletop and drawer face to create decorative flair. 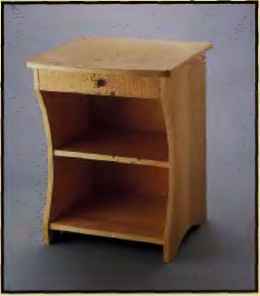 Although it's designed to be used as a night stand, this project could suit a variety of other purposes, such as an end table or telephone table. 3/4 x 151/2 x 25Vi in. VJ2 X 8V2 x 19V2 in. M x 15Vb x 17 in. Vz x 1-V4 x 12 in. 3/4 x 8 x 17 in. Vi X 13/4 X 15 in. 3/4 x 1 VA x 17 irt. Vi x 17V2 x 22Vi in. Va x 12 x 16 in. 3/4 x 15&-8 x I8V2 in. M x 23/4 x 165-3 in. 1Mb x x 17VÉS in. 1M6 x Vi x 20 in. VS2 x 3 x 17 in. i'Mfi x Ws. x 20 in. Vi x 13/ie x 3 in.